City sidewalks, busy sidewalks, dressed in holiday style…and no city dresses up better than New York. From Christmas lights strung through the streets of Little Italy to wreaths hung on lampposts in frosty Central Park, the city is filled with holiday season traditions not to be missed. 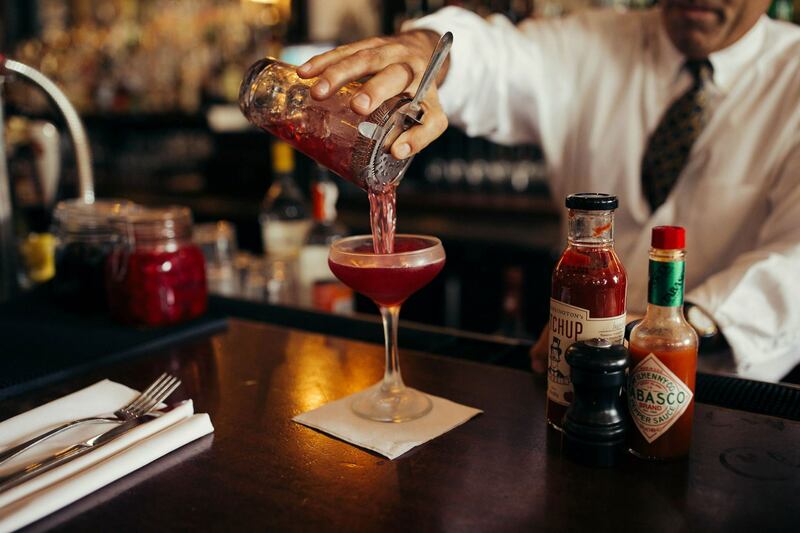 Here, we’ve rounded up four, as well as where to top them off with a tipple. When the frigid gusts of winter blow in, The Polo Bar is the chicest refuge to warm up after braving the cold to see the holiday window displays at the department stores along Fifth Avenue. Set adjacent to the Fifth Avenue Ralph Lauren store—and in easy reach of the windows at Saks, Bendel’s, Lord and Taylor, and Barney’s—it’s the third Ralph Lauren–owned restaurant in the world and as elegant and timeless as the designer’s all- American clothes. 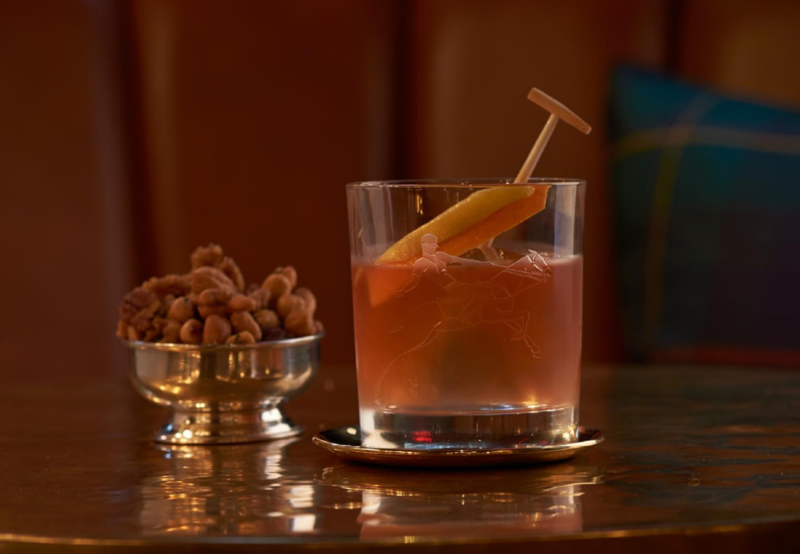 It’s set underground with mahogany ceilings, tan leather banquettes, gold-framed paintings of horses, and a glistening bar where fashion editors and Purple Label–suited bankers meet for old fashioneds on any given weeknight. Craft beers, more than 30 champagnes, and a list of fine wines accompany a menu of craft cocktails, served in heavy glassware with swizzle sticks shaped like polo mallets. For families and patrons of the arts, Lincoln Center is home to some of the most beloved holiday traditions, namely the American Ballet Theatre’s annual performances of The Nutcracker and the open-to-the-public singing of Handel’s Messiah. And while there are many options around for a post-performance drink, P.J. Clarke’s is the nicest and easiest to slip into without a reservation. The extensive bar menu has something for every enthusiast: whiskey lovers will be happy to find a menu of nice bourbons, ryes, and single malts; oenophiles have upwards of 10 by-the-glass options; and those wanting a strong cocktail can opt for such delicious options as the Four Roses Whiskey Sour, a ginger-spiced Pimm’s Cup, or a warming rum punch. Nothing signifies the arrival of the holiday season quite like Rockefeller Center. Its sunken courtyard becomes an ice rink, and an enormous Christmas tree is raised above, twinkling with thousands of tiny colored lights. 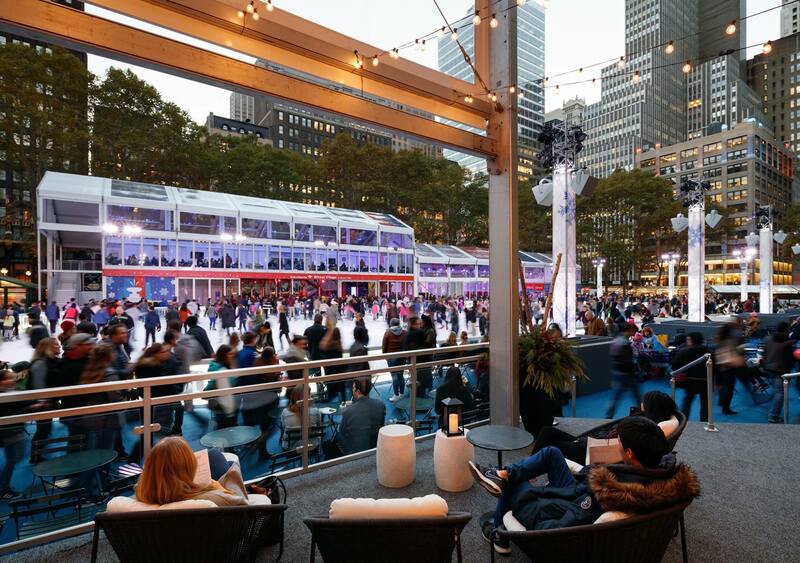 After an obligatory photo shoot in front of the tree or successfully completing some laps on the ice, head into the rink-side Rock Center Café for some prime people watching with a drink in hand. With low ceilings and warm lighting, contemporary furnishings and a stone bar, the café is at once cozy and modern, an ideal atmosphere for tossing back a seasonal cocktail, such as a spiced pear bellini with cinnamon and nutmeg or a vodka-based Apple Crisp with apple spice liqueur and fresh ginger. 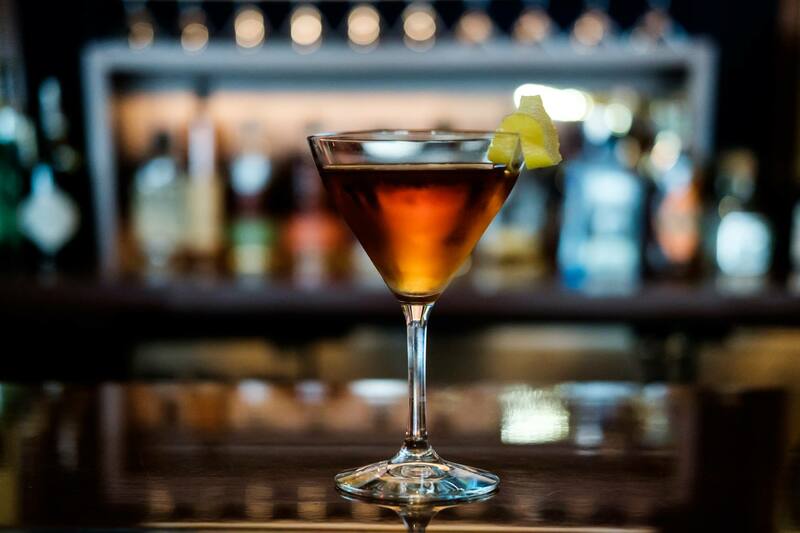 In honor of the rink’s 80th anniversary this year, the menu even boasts a special, hard-to-find classic: The Preakness, made of rye, bitters, vermouth, Benedictine, and lemon that was created the year the rink opened. Right behind the New York Public Library near Grand Central Station, Bryant Park transforms every year into the Winter Village, a miniature township of glass huts. Each is filled with the goods and noshes of more than 125 different vendors, often purveying local and handcrafted goods, and for those friends and family members for whom you just don’t quite know what to get, this is an ideal place to come peruse. In the center of the village is also a free-of-charge ice rink, making the park a place to come and while away a day in winter wonderland, and this year, a new eatery called Public Fare is adding to the appeal of it all. Run by Danny Meyer’s can-do-no-wrong hospitality group, Public Fare has been hotly anticipated since it was announced earlier in the fall and serves sandwiches, coffee, and pastries during the day before transforming into a wine and cocktail bar in the evening. Designed by Crate & Barrel, it’s undoubtedly the most festive place to top off a day in the Village with a glass of red or white, making cheeks even rosier.